By Ujena. This super stylish retro bikini is the perfect bikini and outfit all in one. This 50's inspired high waisted bottomed bikini with shirred panels is oh so retro with a bit of modern flare and style. It is a pinup girls dream bikini. The bottoms are high waisted - something we haven't seen since the 1940's or 1950's. The perfect way to camouflage any extra tummy or bottom weight. Top is a bandeau like top with halter straps. The high waist shirred front bottoms will help cover any imperfections you may have around the belly tummy area. The shirring provides the ultimate camoflage. Great for those who like a bit more coverage...or just simply want to look like Jean Harlow in a bikini. 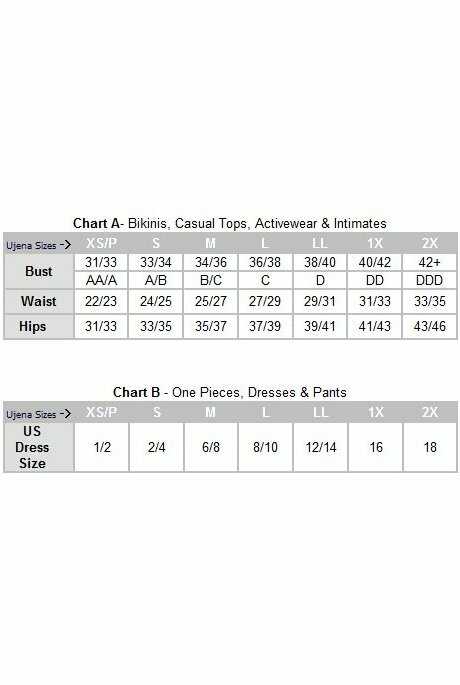 Tops and bottoms are available in individual custom swimsuit top and bottom sizing, for a perfect fit every time! Swimwear designed and manufactured by Ujena, a 100% USA based company! Note: This item may ship separately and will ship directly to you from our factory in the USA.